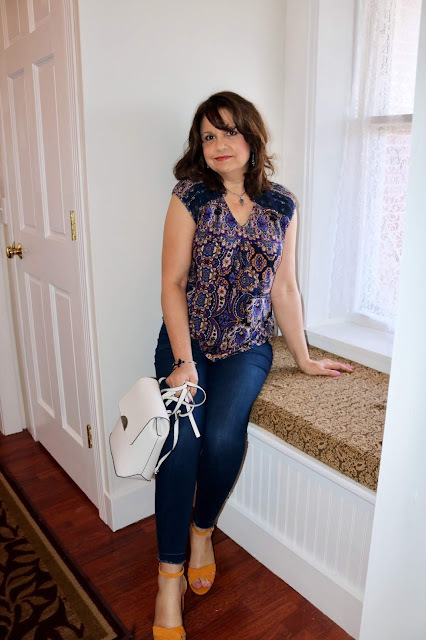 I'm always looking for comfortable casual wear with unique details so I was thrilled to see this Daniel Rainn Cleena Pleated Shoulder Detail Knit Top in my April box from Stitch Fix. It is a very soft knit and feels wonderful to wear. The crochet detail in the sleeves is so pretty. I was also pleased to see a short sleeve top in my box as I'm starting to think of newer warmer weather pieces I might need. The other two tops they sent me were long sleeves. However, this top is not the best cut for someone with heavy arms like myself. I found a great post on Pinterest on what tops to avoid if you have heavy arms, and this top is one of them. Short, capped sleeves should be avoided because "they cut right at the place where the thickness begins and draw attention to that area as well.". This article recommended 3/4 or elbow length sleeves (not really practical for hot summer days!) or wearing flutter or crochet sleeves. The article had lots of other ideas, so if minimizing your arms is something you want to do, you might want to check this article out. Other than the softness of the fabric and how nicely it draped, I really did love the crochet detail on the shoulders. 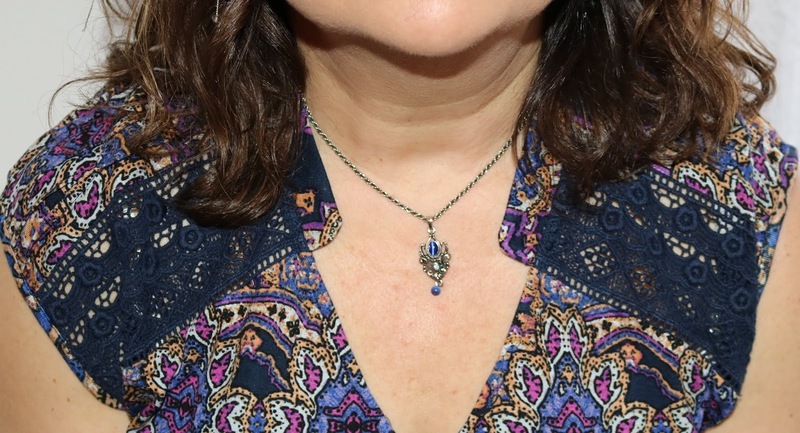 I played off the blue colors by wearing a blue pendant necklace. In addition to the sleeve issue, I also wasn't thrilled with the pattern. The back especially looked pretty weird. I didn't care for the mishmash of shapes going every direction on this top. Plus the side seams didn't add up...something my wonderful readers taught me to look for in printed clothing! Thanks Gals! I wore a purple and silver bracelet and carried a white back pack purse. For shoes, I chose these mustard yellow suede shoes by Steve Madden (also from an old Stitch Fix box). I thought the shoes pulled out the yellow color from the top very nicely. The released hem frayed jeans are from Charlotte Russe (old). For earrings, I went with a black and silver drop earring. 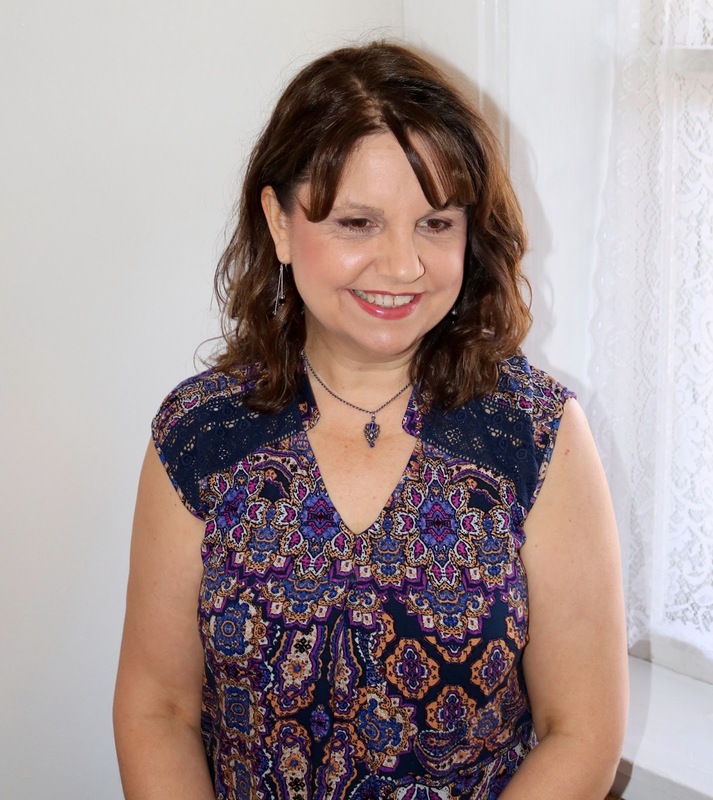 I really did like many aspects of this top: the fit in the bust and bodice, the crochet detail, the neckline, and the soft comfortable fabric. But I did not like the crazy pattern, the mismatched seams, and where the sleeves stopped on my arms. 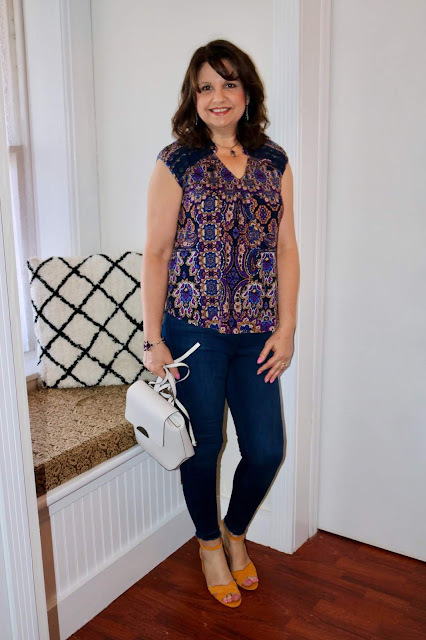 I will let you know if I kept or returned this top on my Stitch Fix Review Post next Friday! 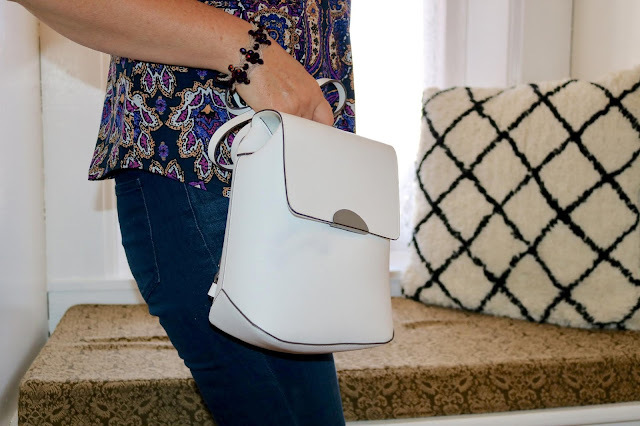 If you've never tried Stitch Fix before, use my REFERRAL CODE to get $25.00 off your first box! I think it's a beautiful top and I personally really love the pattern and colors! The crochet accents are so pretty too! I recently discovered Kay Harms' blog and read one of the blog posts where she mentioned the arms along with lots more great information! That said, while I love the top and I think it looks great on you, I think it would look even better if the crochet details were right on top of the shoulders instead of below. Not sure if you decided to keep the top, I know I would have for the pattern alone :) Oh, and the pendant is GORGEOUS!! Thanks Ellie! I really struggled with whether I should keep this top or send it back. I have a couple of things with crochet detail and I just love it!! And the addition of the mustard shoes.....it's so perfect!! Yes, the crochet Detail is lovely. Thank you. Those shoes couldn't be more perfect with this lovely top! I was glad I had a couple of short sleeve/tanks in my last Stitch Fix box. You just never know what you'll get. 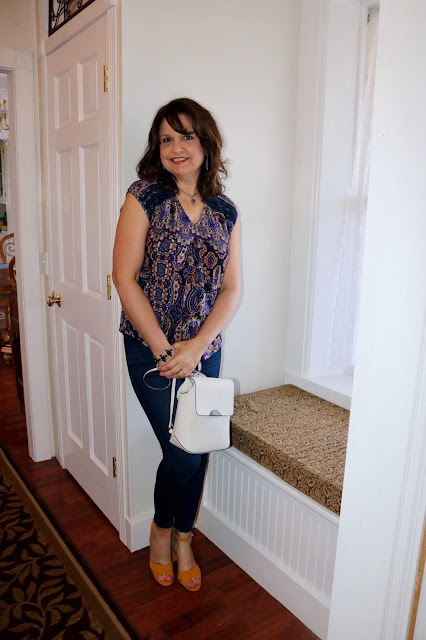 I love the colors and patterns in this top, def. a keeper! Yes, I hope they send me more short sleeve things. That's a lovely top! I like the mishmash of prints actually, I thrifted a top that's a crazy mix of print and colour and it's quite fun to wear! It was only $1 though haha! I'm sure you will return this one as you don't seem very happy with it. Oh, this top was a hard one for me. I liked some things and didn't like others. You'll find out soon if I kept it or not, ha-ha. Thanks for visiting. That top is really pretty, Amy. I love the print! I actually really like the mishmash patterns on this top although I've never been a big fan of crochet detail. I, too, have thick arms. They were stick thin until my 30s when I filled out a little more and also started swimming competitively. I've always been disappointed that I can't wear cap sleeves because I think they are so cute on the right figure! But I'm also surprised to hear that flutter sleeves are ok on thicker arms because I think they look hideous on me! Worse than caps! Thanks for the great post! That is good to know Sarah, because I've never tried flutter sleeves, maybe now I won't even bother. As for the pattern on this top, I liked aspects of it, but I think my top had some flaws. 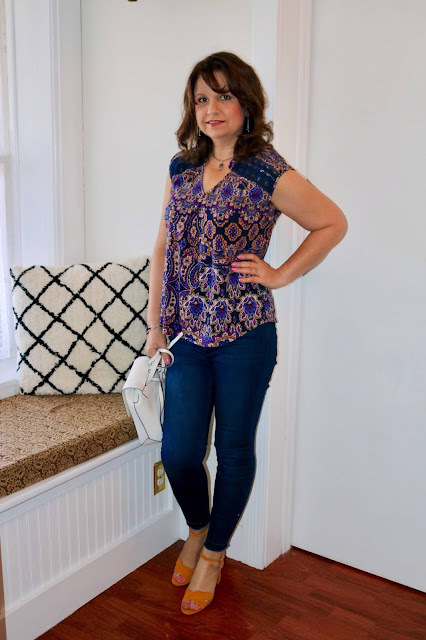 I always google Stitch Fix items before I buy them to make sure I'm not over paying, and the tops I saw in other pictures did not have such a bizarre misplacement of pattern as mine. Shopping With Alethea at IKEA and More!